It’s almost three quarters of a century since Carlton’s oldest surviving senior player kicked himself into the record books. But 96 year-old Clen Denning’s unique feat – six goals from his first six kicks on debut for the Blues - might not have happened were it not for his great friendship with the former West Australian and Carlton centreman, Ron “Socks” Cooper. It all happened in the fourth round of the 1935 season, against South Melbourne at the Lake Oval. “I can only remember the first goal,” Clen explains. “It’s a long time ago after all – 72 years in fact. To put Clen’s on-field moment in perspective, 1935 was also the year that Elvis Presley was born, the FBI took out Ma Barker’s gang and Babe Ruth hit his 714th home run. It was also the year John Curtin replaced Jim Scullin as leader of the Australian Labor Party and aviator Charles Kingsford-Smith, perched behind the controls of the Lady Southern Cross, disappeared off the coast of Burma. The walls of Clen Denning’s retirement home in Melbourne’s eastern suburbs are decked with memories of his rich footballing past – the team photos from Oakleigh, Fitzroy and Victoria for whom he served with great distinction – and of course the all-too-brief days at Princes Park. Born on February 28, 1911, Clen Charles Denning inherited his unusual Christian name from his father, Thomas Clen Denning, but “wouldn’t have a clue” regarding the name’s origins. Clen cut his footballing teeth with Oakleigh, completing his senior debut barely a month after turning 16. Then, when Oakleigh’s senior coach Frank Maher took the helm as coach of Carlton, Clen went with him. Clen made an immediate impression at Carlton - initially sporting the no.34 guernsey later worn by the likes of premiership players Ian Robertson and Alex Marcou, and more recently Ron De Iulio and Simon Wiggins – and finally the no.35 guernsey made famous by premiership players Jack Conley and Peter Dean. “In those days you trained two nights a week and played on a Saturday, because everybody had jobs in those days . . . but they don’t have them now, do they?,” Clen says. For whatever reason, Clen had a falling out with Maher’s successor as coach, Percy Rowe. More than likely, the dispute involved Clen’s inability to dislodge Vallence, then in his penultimate season at Carlton, from the full-forward position. “I know Soapy was full-forward, and one day I played well alongside him,” Clen explains. “Soapy said (to the selectors) ‘Leave him at centre half-forward, I’ll get on well with him’, but they didn’t stick with me there and I never really got a go, so I left Carlton and went to Fitzroy. The move from Royal Parade to Brunswick Street cost Clen a place in Carlton’s 1938 Grand Final outfit, but he forged ahead at Fitzroy regardless. He took out the Gorillas’ goalkicking award with 37 goals in 1939, but finally made his mark as an unrelenting back pocket who took on the best of them - South’s Laurie Nash included. In the end, Clen represented Fitzroy with distinction in its famed 1944 premiership team, turning out in a back pocket alongside the resident full-back and captain-coach Fred Hughson. 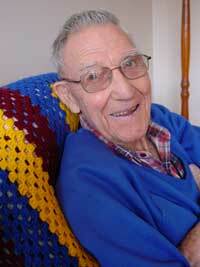 Denning was 36 when he gave League football away in 1947 to take on the job as captain-coach of Ararat. Again, Clen would make his mark, featuring in the Rats’ first and only Wimmera League Premiership with a six goal caning of arch-rival Stawell. It wasn’t until 1950 that Clen finally hung up the boots at the ripe old age of 39. Most of Clen Denning’s old teammates have gone now, but his love for the game remains undiminished. 1984 - Blues Life Member: Ken Sheldon.